today is a very important day. yes, it’s all saints day + yes, it begins the dia de los muertos celebration, but more importantly, it’s my honey’s birthday. i won’t bore you with too much lovey doveyness, but i would like to take advantage of this day + give a holler to the man behind the fearless homemaker. thanks, honey, for patiently nodding when i talk about the importance of eating healthy, + not pointing out my hypocrisy when i sit down to a dinner of ramen noodles, pickles, + two martinis. thanks to you (+ your dad) for teaching me how to fish, now one of my favorite pastimes. double thank you for not making me bait the hook myself, because that gives me the heebie jeebies. in short, thanks for being a whole lot of awesome + making me smile. happy birthday! 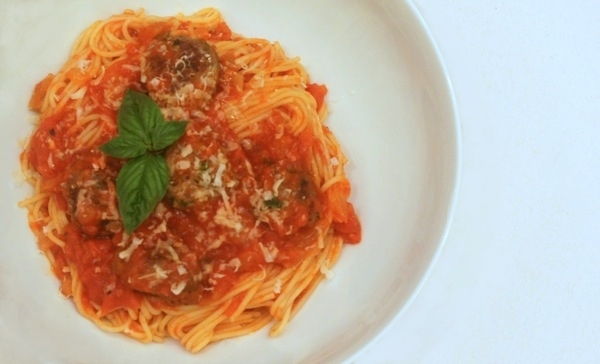 in honor of honey’s birthday, today’s recipe is one of his favorites – meatballs with parmesan + parsley. these are delicious served with fresh pasta + marinara, or on a toasted baguette with provolone cheese. they are similarly tasty fresh out of the pan as a snack, which is convenient because you cannot cook these without becoming ravenously hungry. try ’em – they’re perfection! 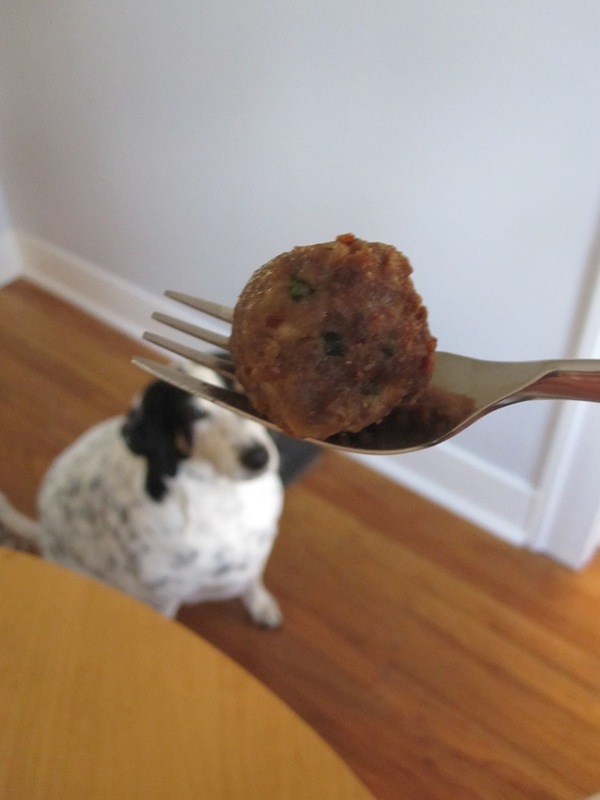 not surprisingly, this meatball photoshoot caught the eye of an interested hopeful participant. stir eggs, breadcrumbs, parmesan cheese, 3 tablespoons olive oil, parsley, garlic, 2 teaspoons salt + pepper in large bowl to blend. add ground beef + mix thoroughly. form mixture into 1 1/2-inch diameter meatballs. pour enough oil into heavy large skillet to coat bottom; heat to medium-low. working in batches, add meatballs + fry until browned / cooked through, turning frequently + adding more oil as needed, about 15 minutes per batch. transfer to plate. I love how you said all your thank you’s to a great guy in your life! Those of us fortunate enough to have wonderful mates need to be expressive and appreciative! I have no doubt he will also love your recipe. Wish I could enjoy it, but it has ingredients off limits for me. I’ll just enjoy the image, plus your dog looking so envious of people food. I knew you were going to post this one today as you’ve been teasing me on twitter :). I have the ingredients out already to make them – though I’m going to have to halve it. Can I say your dog looks like he has eaten all the meatballs in that picture and that he eats a lot of your cooking – LOL. 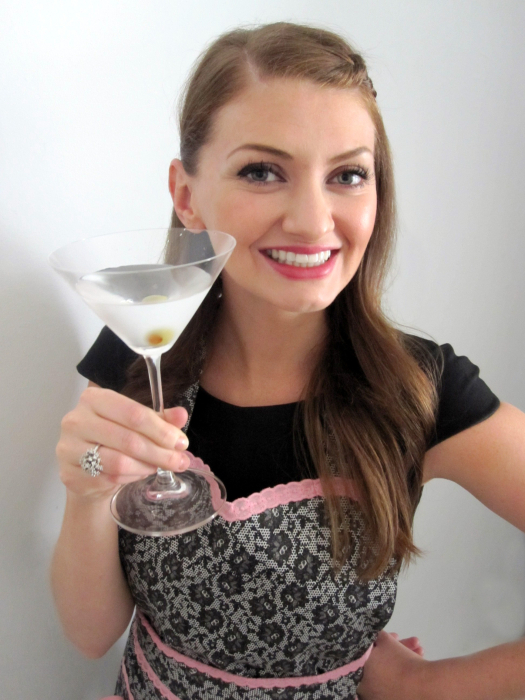 You just come up with the most yummy recipes Amy and I love the style of your blog. Happy Birthday to your honey! That all looked so yummy that even though I just ate, I find myself drooling a little bit. Can’t wait to keep reading! Did you see my meatball recipe? Ahhhhhhhhhh…the joy and love of a spouse is a great thing…and besides your great recipe (which I will use to tweek my own) I love how you capture what I think of as great love. It’s the patience, kindness, and all the small things that they do that add up to a great big LOVE! And, by cooking his favorite meal in the state of your love, well, no better meal will be had! After all, isn’t the greatest ingredient in any cooked food love? All I can say is Yummmm! I’ll substitute ground turkey as I don’t eat red meat, but still sounds like a winner! I think I’ll make it for my honey who likes yours is someone very special who warrants being spoiled occasionally. Thanks! Hmm, I read your blog right at lunch time! I am not a very cook so I appreciate your blog and recipe. I’ll definately have to watch for your posts! How wonderful to give a shout-out to your hubby! Who doesn’t love meatballs? In our house we have to do them gluten-free and cow-dairy-free, so I use breadcrumbs I make up and freeze and Sheep Romano instead of the Parmesan – otherwise very similar to yours – have you tried 1/2 beef, 1/2 pork? thank you for the joyful post! Meatballs bring back wonderful memories of my grandmother who made the best meatballs ever, and her recipe is very similar to yours! the only real difference i see is that she added a pinch of allspice to her recipe. Since my husband has been on a diet, we haven’t been eating spaghetti and meatballs for awhile, so this is making me drool…hopefully i can convince him to break down for one night! Great tribute to you husband, the recipe doesn’t seem to bad either! Haven’t had much luck making meatballs, maybe I should give these a try! OOhhhhhhh YYYUUUMMmmmmyyyyy! Thanks for the addition to my recipe book MUST TRYs! Nom nom (as my daughter would say). I loved how you combined food with thanks- what better ways to be grateful! My hubby eats red meat so I will make these for him and maybe, like Janet above, substitute turkey meat for me. My husband also loves pasta. This would be a great birthday dish for him as well. I can’t show him your blog though or he’ll wonder why I never write such nice things about him. Its great of you to honor him like that. Thank you for the recipe. I’ll definitely use it. I am always looking for new recipes. My husband also has a birthday this week. I always make a special meal for him. I may try your recipe along with one of his favorite deserts. Have you tried ground chicken? I sometimes it better than ground turkey. What a wonderful husband. Supportive of creative self including hamburger helper! Love that. I too adore a good meatball. In fact my soon to be ex cooked us delicious meatballs for dinner. Such mouthwatering goodness. I should have had a martini! Love reading recipes and eating what others cook. The Home Makeover Mixtress blending cool and cozy style! Wow! I have never put the word “fearless” in the same sentence as “homemaker” but it sounds like YOU’VE got it going on! The recipe sounds delicious and I am going to print it out and try it one of these cold autumn nights. (And I’ll be returning for more recipes, for sure!). julia, i’ve never tried these with ground chicken, but i too prefer ground chicken over ground turkey. i use it in tacos, burritos, + some asian dishes if i don’t want to use ground beef. good suggestion! Me again. I made these for my new squeeze, and we LOVED them. Had so many leftovers – can’t wait to have them again. hey, you again. =) i love that there’s a new squeeze + i’m thrilled that you made/enjoyed these! this recipe does make a ton of meatballs – what i usually do is ball/cook half of them to start, freezing the rest of the meat to use a month or more later. with the ones that are cooked fresh, we generally eat half that evening, then the other half a few days later for lunch or dinner. so we get 4-5 meals out of one batch. NOM. of valuable experience aboսt unexpected emotions.